T Rob Havenstein vs. 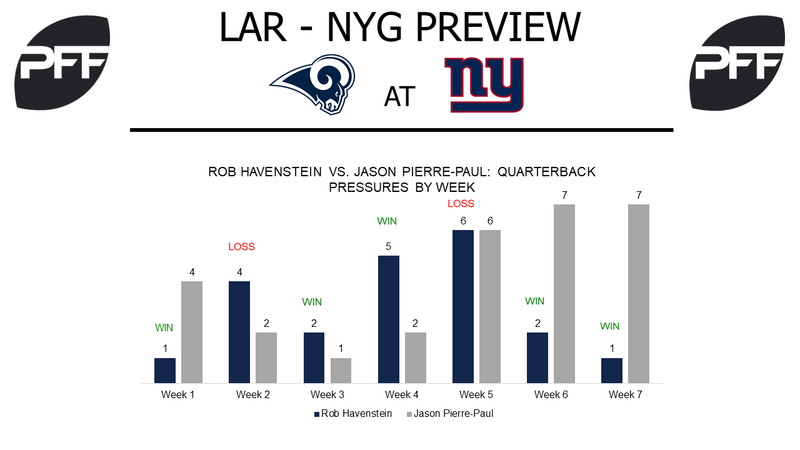 Edge Jason Pierre-Paul – Right tackle Rob Havenstein’s two highest graded games came in back-to-back weeks heading into the bye, as he finished Week 6 with a 77.4 and Week 7 with a 77.9, respectively. Over Weeks 6 and 7 Havenstein held the 15th best pass-blocking efficiency among the league’s tackles with a 96.2 and had allowed only three quarterback pressures, tied for 10th fewest, after tying for the league’s most allowed pressures in Weeks 4 and 5 with 11. His matchup on Sunday will be against a Jason Pierre-Paul that had the league’s 13th highest pass-rush productivity across Weeks 6 and 7 among edge defenders and 14 quarterback pressures, tied for second most among all edge defenders in that same span. WR Sammy Watkins vs. CB Ross Cockrell – With the team’s suspension of cornerback Janoris Jenkins, Sammy Watkins will see cornerback Ross Cockrell in his place on Sunday. Cockrell and Watkins faced off in 2016 when Watkins was with the Bills and Cockrell was with the Steelers. Watkins caught all three targets thrown to his coverage for 46 yards, while those three catches were the only he allowed on five targets in that game. Watkins has played in two games after the bye since 2014 and has combined for 12 catches on 16 targets for 195 yards, one touchdown, zero drops, and a passer rating of 136.2 when targeted. RB Todd Gurley vs. Giants Run Defense – In Todd Gurley’s last game before the bye week, he forced four missed tackles in the run game, tied for most among all halfbacks in Week 7, after not forcing more than two in any game this season. He now has 14 forced missed tackles in the run game, which is half of what he had in all of 2016, and five more in the passing game, eight less than all of 2016. He will face a Giants defense that is averaging a missed tackle on 13.8 percent of their tackle attempts, the eighth-highest rate among all 32 teams and they have combined for a total of 56 missed tackles, seventh most in the league. TE Evan Engram vs. LB Mark Barron – The fifth-most targeted tight end in the league draws a tough matchup this week in linebacker Mark Barron. Engram currently ranks fifth among all tight ends with 233 total snaps in route, and was targeted ten times in Week 7, the most among all tight ends. His receiving grade of 75.4 ranks 11th among 49 qualifying tight ends. Barron is currently the eleventh-highest graded linebacker in the league, with an overall grade of 83.7. In Week 7 against the Arizona Cardinals he allowed zero receptions on five targets, grabbing one interception. Despite the tough matchup, with a depleted receiving core and his high usage so far this season, expect to see Engram continue to be a focal point of this Giants offense. G John Jerry vs. Dl Michael Brockers – The 33rd ranked guard (out of 78 qualifying guards), John Jerry draws a difficult matchup in defensive lineman Michael Brockers. Jerry has allowed two sacks through Week 7; only six guards have allowed more this season. He’s allowed 11 total pressures, 22nd most among 76 qualifying guards. Brockers currently ranks 14th among 117 qualifying interior defenders with an overall grade of 86.6. His run-defense grade of 91.0 is the fourth highest among all interior defenders. Jerry will have to hold his own against Brockers, as fellow guard D.J. Fluker draws arguably the toughest matchup of all Giant’s players Sunday. G D.J. 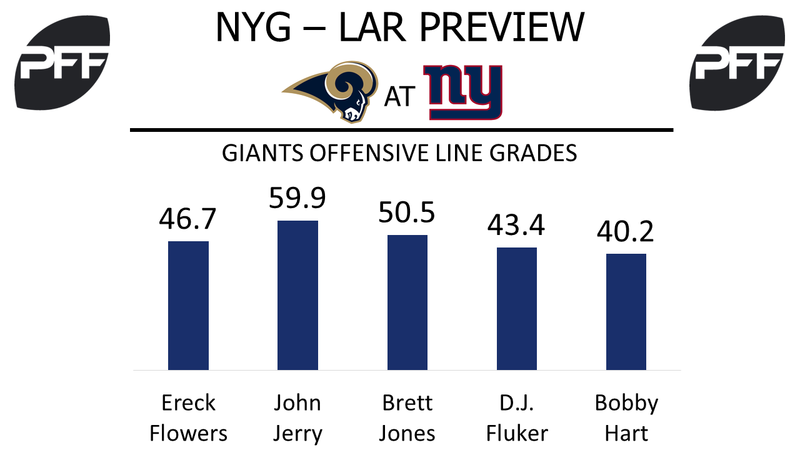 Fluker vs. Dl Aaron Donald – This is the individual matchup to watch for on Sunday. D.J. Fluker is expected to see plenty of current No. 1 rated interior defender Aaron Donald. Donald’s overall grade of 95.3 currently sits as the highest grade among all players. He’s posted an impressive 94.8 pass-rush grade, the highest among all players. His 40 total pressures are third-most of any player in the league, and four more than the next closest interior defender. He boasts a pass-rush productivity (measures pressure created on a per snap basis with weighting toward sacks) of 15.9, the highest among all interior defenders. The Giants must figure out how to limit Donald’s presence, as he can single-handedly wreak havoc on any offense.